There are several common foods that are made with fungus. According to the Cleveland Clinic, it's important for some people to identify and avoid these foods if they have allergies to certain types of fungus. Symptoms of a reaction to fungus, particularly mold, could include a runny nose, watery eyes, wheezing and a rash. If you think you may have a fungus allergy, you should see a doctor for further testing. 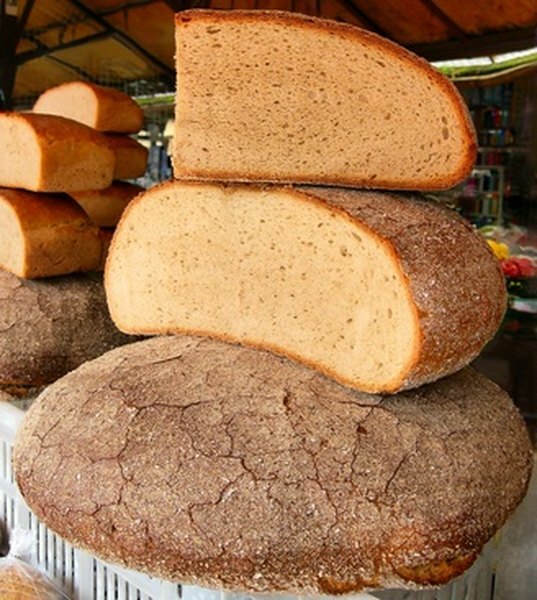 Bread is one of the most prominent examples of food made with fungus, according to the University of Hawaii. Leavened bread contains yeast, a type of fungus that causes the dough to rise and the final product to be light and fluffy. Leavened bread can range from the tall loaves that people use to make sandwiches to flatter specimens, such as naan, pizza dough and pitas. Unleavened bread is bread that is not made with yeast. Many soft and semi-soft cheeses contain fungus as an active ingredient. Moldy cheeses, such as Camembert and Roquefort, are injected with a strain of Penicillium to develop their distinctive flavors and textures. If you look closely at Roquefort, you can even see the fungus' blue-green mycelium running through it. Cheese makers use fungus to make many other varieties of cheese, including Brie, Stilton, Gorgonzola and Limburger. Most of these cheeses contain strains of Penicillium, though some, such as Limburger, are made with a combination of yeast and bacteria. Fermented soy products are produced using yeast in the United States, though in the Eastern world a number of different fungus strains are used to the same result. These soybean-based food items include soy sauce, tempeh, miso paste and tofu. Some of these foods, such as soy sauce, are frequently made without the aid of fungi, so if you have a mold sensitivity it may be worth your while to hunt for a variety that is safe for you to consume. Can You Have Cottage Cheese When You Are Pregnant?